[NEW YORK, NY] With the first week of trial in Chevron’s RICO case over, it is becoming clear that the oil giant is facing significant hurdles as it attempts to salvage a verdict that will allow it to block international efforts to enforce the $19 billion Ecuador judgment. After the first four witnesses, several issues have come into sharp focus. First, Chevron is willing to give up major portions of its RICO claims to avoid compelling evidence of its environmental pollution and corrupt activities in Ecuador from coming out in court. At the same time, Judge Lewis A. Kaplan is doing everything he can to assist the oil giant’s case. Kaplan has blocked most lines of questioning about environmental contamination, blocked evidence of Chevron’s surveillance of Donziger, granted Chevron a trial preparation room five times the size of that used by Donziger and Ecuadorian defendants Hugo Camacho and Javier Piaguaje, and most notably, has twice taken over the questioning of Chevron witnesses. “I don’t think there’s a lawyer in the world who would guess that this is a RICO case had they sat through the first week of trial,” said Christopher Gowen, the spokesman for Donziger. 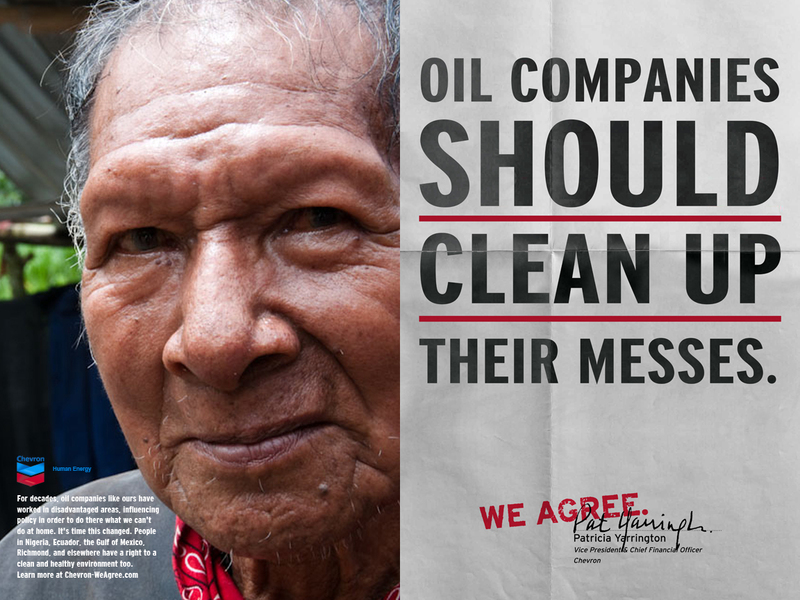 “Chevron clearly wants to retry the Ecuador case that it lost in its preferred court”. Gowen said Chevron’s case rests largely on a veritable parade of witnesses “who seem to personally dislike Steven Donziger” but have little information relevant to the legal claims in the case. “Chevron will continue to use this proceeding to try to destroy Donziger’s reputation by distorting facts about him, which seems to be central to their strategy,” he added. The most stunning development occurred the first day when Chevron dropped a key predicate RICO act alleging that Donziger and his colleagues pressed for prosecutors in Ecuador to file “bogus” criminal charges against Ricardo Reis Veiga, a top Chevron lawyer. Just as lawyers were about to confront Reis Veiga with evidence that the charges were based on scientific proof that he designed and supervised a fraudulent remediation, Chevron agreed to drop that issue. Another of Chevron’s key witnesses, a former technical consultant for the rainforest communities named David Russell’s written testimony, authored by Chevron’s lawyers, stated that Donziger pressured him to put out an inflated damages estimate in 2003 to pressure the company into a settlement. Curiously, Mr. Russell had a much different tone during a 2003 interview with The Wall Street Journal where, in his own words, he called the Ecuadorian contamination “larger than the Chernobyl disaster”. Under cross-examination on the stand, Russell testified that he spent days putting together the assessment based on assumptions then available from limited data, and did so with no interference from Donziger. Whether the thousands of dollars Mr. Russell has made from Chevron for his “testimony prep” influenced his testimony is rather obvious. Russell even admitted that Chevron lawyers at Gibson Dunn & Crutcher wrote his testimony for him in the first person. Chevron scientist Sara McMillen was caught having to admit that the company’s technical experts were told to only look for “clean” soil samples during the judicial inspections. Donziger has long accused Chevron of engaging in junk science to defraud Ecuador’s court. (For a copy of his own claims against Chevron that Judge Kaplan would not let go forward, see here). McMillen also conceded that Chevron called its own paid experts “independent” – the exact same term used by Donziger and his colleagues that Chevron claims was inappropriate. First, the main activity in the case took place outside the U.S. in Ecuador, while the statute only applies to acts in the country. Second, now that Chevron has dropped money damages claims to avoid a jury, there is no equitable relief remedy available (such as an injunction blocking enforcement). Third, and most notably, Mr. Donziger did not commit a “predicate act” as clearly required by the RICO Statute, according to Gowen. “Chevron figured out how to avoid a jury because the company knew full well New Yorkers would have seen through its charade,” he added. » The Sparrow Project was grateful to be able to assist the Ecuadorian pollution victims in securing favorable media coverage on Huffpost Live [HERE & HERE], as well as Democracy Now! and Breaking the Set in hopes to juxtapose much of the business-centric articles like this one in Bloomberg Businessweek. Tagged Chevron, Ecuador, Gowen Group, lawsuit, RICO, Steven Donziger, Texaco.